The Senate adopted my resolution designating the week of January 1 through January 7, 2019 as “First Responder Appreciation Week” in Pennsylvania. First responders include fire, police and emergency medical personnel. They are likely to be the first people to arrive at and assist at the scene of an emergency, such as a vehicle crash, structure fire, natural disaster or terrorist attack. Senate Resolution 11 recognizes that these individuals make a tremendous difference in our communities every day through their selfless acts of service and their sacrifices. We owe a huge debt of gratitude and our eternal thanks to each and every one of them, and very especially to their families. First responders make personal sacrifices in order to keep the Commonwealth safe and sometimes make the ultimate sacrifice in the line of duty to ensure the well-being of the citizens of Pennsylvania. These men and women should be honored the first week of the year to show our renewed respect, appreciation and gratitude for those that carry out the critical role of protecting and ensuring public safety for all of us. Legislation I’m co-sponsoring to ensure that public employees who commit job-related felonies are stripped of their taxpayer-funded pension was approved Tuesday by the Senate Finance Committee in a unanimous, bipartisan vote. The bill was also moved out of the Senate Appropriations Committee and now moves to consideration by the entire Senate. This legislation, Senate Bill 113, closes the loophole used by unscrupulous public officials whereby they plead guilty to non-forfeiture crimes so they can keep a pension. It would require pension forfeiture if a public employee or public official is convicted, pleads guilty, or pleads no contest to any felony offense related to his or her employment. I supported this legislation when it passed the Senate in the last legislative session, and I look forward to seeing it through to enactment this session. Senate Bill 9 designates the Eastern Hellbender as Pennsylvania’s state amphibian. Senate Bill 26 releases Project 70 restrictions on lands owned by the Borough of Topton, Berks County, in exchange for the imposition of the restrictions on other lands to be acquired by the borough. Senate Bill 130 releases a use restriction and reversionary interest affecting a property located partly in the Township of Mahoning and partly in the Borough of Danville in Montour County. Senate Bill 127 reauthorizes Pennsylvania’s 911 Law, which is set to expire on June 30, 2019. Senate Bill 128 codifies the Civil Air Patrol’s state operations in Title 51 under the leadership of the Adjutant General. 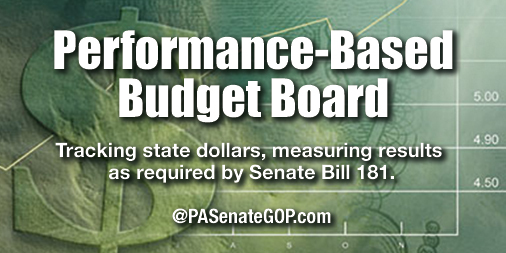 The Performance-Based Budgeting process – measuring state spending against expected results – got underway in Pennsylvania last week. I authored the legislation to implement this new process, and I am excited to see it moving forward. The Performance-Based Budgeting Board approved reports by the Independent Fiscal Office to grade the Banking and Security Department and General Services Department, as well as criminal justice agencies and tax credit programs. Reports will eventually be produced to measure performance of every agency controlled by the Governor’s Office. You can view the recent board hearings here. The Senate returns to voting session on Monday at 1 p.m. You can watch session live at PASenateGOP.com.